An economic tsunami is coming our way – robots, automation and digital technology are making once reliable, well-compensated jobs obsolete. 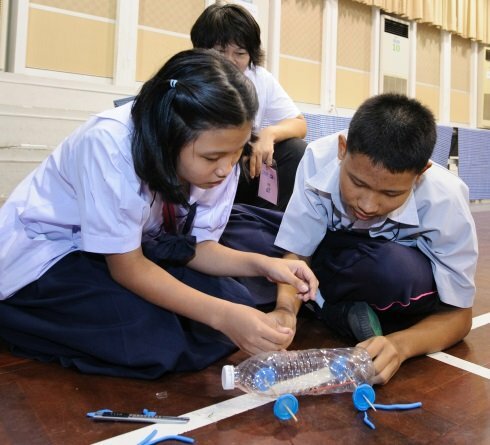 Today, Thai kids, more than ever before, must be able to think critically and dynamically apply science, technology, engineering and math (STEM) to solve complex problems. Without developing key 21st century skills, Thai children are destined to sink in the fast-paced, Industry 4.0 era. The solution to overcoming the challenges of the Industry 4.0 era is to empower kids now with the skills to succeed in the jobs of tomorrow. This involves giving students opportunities to immerse themselves into projects and activities that compel them to develop 21st century skills and an innovative mindset. Kenan Foundation Asia’s Innovation Camps offer precisely that: a space to explore new ideas, solve difficult problems and grow their 21st century skills, such as critical thinking, communication skills and teamwork. By building students’ 21st century skills and deepening their understanding of key concepts in science and math, we move Thailand closer to its Thailand 4.0 goal. Working with global education leaders, including the Smithsonian Institute and the New York Hall of Science, Kenan adapts and adjusts international best practices and curriculums to meet the needs of Thai children – to ensure what they learn from these informal settings will enhance their success in the formal Thai classroom. So what does an Innovation Camp look like? It’s an energetic, one-day trip inside the exciting world of STEM. Children learn key concepts, such as force and motion, electric power and civil engineering, and then perform experiments that bring these concepts to life. Regardless of the days theme; Science Innovation Day, Technology Imagination Day, Engineering Fun Day, or Math Exploration Day, the activities are all the more powerful because 21st century skills development is baked into each activity. At day’s end, students have a newfound grasp of STEM concepts, which they can readily apply into real world situations, and a love of STEM subjects. Racing with the Sun is a great example of the type of stimulating activity that children are exposed to at a Kenan Inspiration Camp. Instead of learning about STEM as separate entities, Racing with the Sun blends them together through a challenging, project-based activity. The activity asks students to build their own cardboard cars from scratch and use solar cells to absorb energy from the sun to fuel their vehicles. Through this exercise, students gain a practical idea of energy currents, geometry and a host of other STEM components that link directly to what they learn in school. Rather than the traditional method of top-down, rote learning, Kenan Innovation Camp nurture students to become confident thinkers and independent doers who can work with others to solve complex problems. Instead of being told what to do or what the answers are, students conduct hands-on, inquiry-based activities and discover answers on their own. Through trial and error, students learn from their failures and devise new solutions to overcome problems. Students will return to their classrooms with a new energy and enthusiasm for learning and exploring. Developing high-skilled, knowledge-based workers takes time, but it begins with a simple step. Kenan Innovation Camps offer an exciting space for companies to help prepare students for an empowering career in the 21st century, servicing as a key means for inspiring students to work toward a good paying STEM career, and making them hungry to learn more. Contact us today by completing the form below to learn more about Kenan Innovation Camps.